October 20, 2014 / Bronx Neighborhoods / Bronx Hospitals & Healthcare / Gotham Buzz. I rarely leave Manhattan for a story, but last week I had an opportunity to attend an NPR forum on the Affordable Care Act at the New Jersey Performing Arts Center in Newark. The program was designed to look back on the promise, disappointment and possibilities of Obamacare one year since the program was rolled out. October 20, 2014 /Bronx Neighborhoods / Bronx Hospitals & Healthcare / Gotham Buzz. Continued. Obamacare was a story I thought would be a big news item throughout the year, but in fact - after the enrollment period ended - so did the news. Hence, when I heard NPR offer folks an opportunity to hear experts in the field discuss how the program was faring, I couldn't resist hearing how the Affordable Care Act was faring. The event was sold out, so I wasn't the only one interested in obtaining some kind of update on Obamacare. 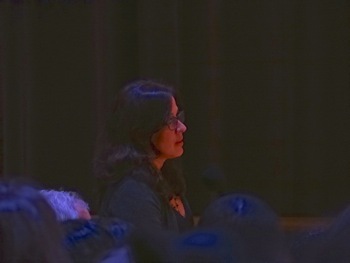 There were roughly 200 some people in the audience, and as near as I could tell by the Q&A session and the folks I conversed with before and after, they were primarily from the Newark area. To be sure, in a publicly funded program this size, there are a ton of issues. Issues include social welfare, public policy, government economics, the economics of the insurance and healthcare systems and politics. Since too much noise is given to the latter - politics - we're going to generally leave politics out of this report. Most of the political statements distort the realities and many of the nation's established media no longer do the yeoman's task of helping put things in context. NPR is one of the exceptions to that last statement - and hence this program. Please note that in addition to reporting what I heard at the NPR Forum, I will be adding contextual information taken from generally reliable sources. 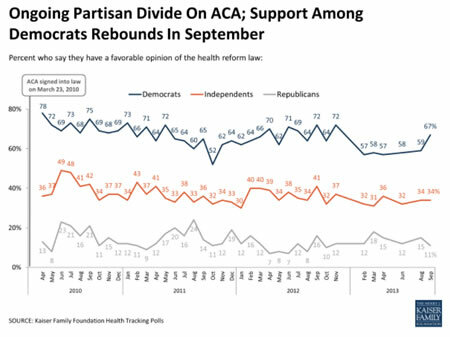 The chart to your right shows how divided the nation is politically with regard to the Affordable Care Act with two thirds of Democrats supporting it [top line], about a third of independents supporting it and about 90% of Republicans opposing it. So politically it's a divisive issue. 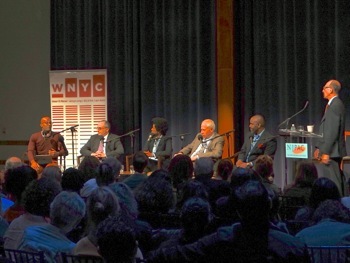 The panel of experts was hosted by NPR WNYC talk show host Brian Lehrer and WNYC reporter Kai Wright. The panel of experts included Byron Hurt who is a filmmaker and director of Soul Food Junkies, Dr. Sandra Scott who is an Emergency Medical Director at University Hospital, Dr. Joel Cantor who is Director of Rutgers University Center for State Health Policy and Larry Altman who is the Vice President, Office of Health Care Reform and Strategic Initiatives at Horizon Blue Cross Blue Shield of NJ. 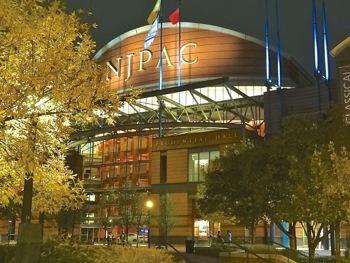 As mentioned previously the forum was hosted at the New Jersey Performing Arts Center which is shown in the photo to your right. 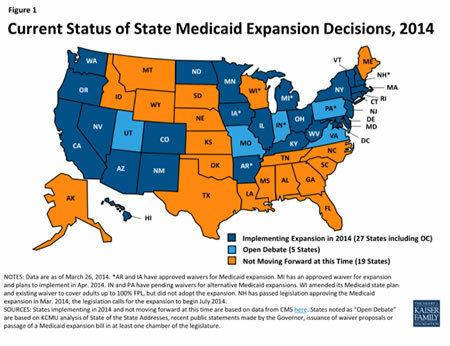 It's worth noting that both states implemented Medicaid Expansion plans. We did a bit of research about Medicaid expansion, which we'll share a bit later in this report. It's also worth noting that the conversation is about the New Jersey implementation of the Affordable Care Act, which differs from the New York implementation of the Affordable Care Act - because New York State implemented the program at the state level, while New Jersey did not. New Jersey opted to use the federal Affordable Healthcare Act platform and resources. The difference is one of local control [NYS] versus federal control [NJ] which arose as a talking point several times during the discussion. Given the locale of the forum, Newark, it's important to provide some context about the Newark, NJ area. One of the audience members said that the inner city median income is $11,000 per year, which we were not able to confirm. The median household income in Newark is $34,000, which is substantially lower than the U.S. median income of $52,000 per annum. So relatively speaking, Newark is a lower income area. That said, the New Jersey Performing Arts Center is part of an ongoing effort to revitalize Newark, and I found myself liking the downtown area which is currently home to a growing number of large white collar corporations. 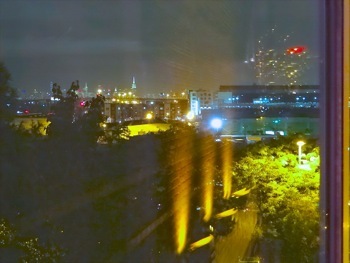 The photo to your right shows a view of the Empire State Building from inside the NJPAC in Newark. Newark is a 20 minute train ride to Manhattan. The cost of Manhattan real estate is five to ten times more expensive than the real estate in Newark only 20 minutes away. Kai Wright, the NPR reporter, said that the uninsured rate in America dropped due to the Affordable Care Act. The rate he quoted was that the uninsured dropped from 21% to 10%. We cross-referenced these numbers with other sources, which tended to show that the uninsured in America dropped from about 18% to 13%. It's possible his rates may apply to Affordable Care Act states only - as 24 of the 50 states in the Union did not implement the Affordable Care Act. The chart to your right, provided by the Kaiser Family Foundation [an independent non-profit that conducts a lot of research regarding healthcare issues in America] shows the states which adopted Medicaid expansion [blue], those considering it [light blue] and those states which declined it [orange]. Nationwide over 8 million people signed up for Affordable Care. In New Jersey the number of those signing up for Affordable Care private plans and expanded Medicaid was between 250,000 and 300,000 in a state with a population of about 9 million. About 80% of those who registered received some sort of financial assistance. These numbers are proximate because there are many different ways to categorize them with some changes occurring since enrollment ended March 31, 2014. In New York about 980,000 registered for Affordable Care in a state with a population of about 19 million. About 75% of those who registered received some financial assistance. In both states somewhere in the neighborhood of a third to one half of the recipients were eligible for Medicaid Expansion, which both states implemented. Estimates on both sides of the aisle are hard to evaluate. The Democratic Administration sold the program as a means of budget deficit reduction as it was believed that the program would slow the rate of healthcare cost increases via preventative care and the evolution of a more cost efficient healthcare system. The Republican opposition has long said that it's another government giveaway and will add about $140 billion more to the deficit annually in the next ten years. The bipartisan Congressional Budget Office has withdrawn its estimates of budgetary impact after forecasting budget deficit reductions. Because of the substantial number of enrollees receiving some financial aid, one of the panelists called the Affordable Care Act a poverty program. They alluded to prior poverty programs in America. The two most significant were those of the Johnson and Roosevelt Administrations. The Johnson Administration campaigned for the Great Society in 1964 and in 1965 implemented Medicare and Medicaid. And the Roosevelt Administration campaigned for the New Deal in 1932 and in 1935 implemented Social Security. In 1942 Roosevelt said that 'freedom from want' was one of the four basic human freedoms governments ought to strive for all humanity. The other three are freedom of speech, of worship and fear. I believe it was Brian Lehrer [might also have been Kai Wright] who recited three of the most pressing issues associated with the Affordable Care Act: 1) Are there enough Medicaid Physicians, 2) Does the Fail Model work in the Emergency Room and 3) what should we expect vis a vis enrollment going forward. This question was not directly addressed in the forum. Based on what I could glean from those with whom I conversed, I got the impression that a few self-selecting healthcare providers and health insurers would find ways to make the economics work. The Horizon Blue Cross Blue Shield of New Jersey was one of the top companies to register ACA enrollees in New Jersey and they said the economics worked a bit better versus expectations. The Horizon Blue Cross Blue Shield of New Jersey representative said that companies will need to find ways to better manage costs, while delivering quality healthcare to large numbers of patients. I got the impression from his comments that he believed that over time a few companies would figure out ways to provide large numbers of patients with healthcare at low prices while making a good profit. Larry Altman of Horizon Blue Cross Blue Shield of New Jersey is shown at left in the photo above, sitting next to Dr. Sandra Scott of University Hospital in Newark. Dr. Sandra Scott, Medical Director of the Emergency Room of University Hospital in Newark [in photo above] said that she's seen an increase in the number of patients coming to the emergency room with an insurance card, including Medicaid recipients. This is the highest cost care in the U.S. Medical system and it's now covered by the Affordable Care Act. But she said she now has referral options that weren't available to her previously. Hence once a patient's needs are taken care of in the Emergency Room, the patient can then be transitioned over to a primary care physician via the Affordable Care Act navigators and resources. She believed that over time this would reduce the people coming to the Emergency Room for free, high cost primary care, which historically has been paid for by the government. In the past there weren't any disincentives in place for hospitals to discourage the use of Emergency Rooms as primary care facilities because the work wasn't challenging and could be billed out at some of the highest rates in the hospital. Hence Emergency Rooms were a significant revenue and profit generators. Joel Cantor, Director of State Health Policy for Rutgers University, chimed in stating that the Affordable Care Act penalizes a hospital for every return visit within 30 days by patients covered by the Affordable Care Act. The ACA simultaneously makes transitory resources available. He went onto say that the ACA is not a perfect system and more work needs to be done, but the ideas and programs are sound. One concern was that resources were budgeted for reduction in year two, while everyone is still learning the system. On the left in the photo at right is Joel Cantor Director of State Health Policy for Rutgers University, seated next to him is the documentary filmmaker Byron Hurt, the documentary filmmaker of Soul Food Junkies. Larry Altman, VP of Healthcare Reform & Strategic Initiatives for Horizon Blue Cross Blue Shield of NJ, said that the economics of the Affordable Care Act came in a bit better than expectations. He appeared bullish on the Affordable Care Act saying that healthcare reform was a way to improve the nation's health. He said healthcare institutions had to drive down costs while accommodating increased demand - but that that was up to the institutions, not the government. And that the overall objective in the entire program was to improve outcomes. He went on to say that the government subsidies for individuals making up to $46,000 [roughly] and for families of four making up to $95,000 [roughly] help by providing them with affordable access to the healthcare system. He also said that not having lifetime limits and in some cases no co-pays helps too. He went on to note, however, that this has the effect of increasing the overall cost to the government. Those who don't enroll in insurance will have to pay a penalty when tax time comes. Larry said that the American healthcare system is the very best in the world for those who can afford it - but it's not the best in the world for the average citizen and that many other nations do far better. 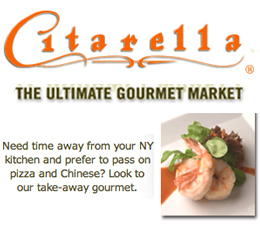 See November 13, 2013 story by our sister web magazine about the rollout of Obamacare in Queens. Larry went on to say that the way to improving the overall system is to improve the coordinated care between the various healthcare providers. The Affordable Care Act put incentives in place to facilitate more coordinated care early in the first term of President Obama by providing government subsidies and discounts to healthcare organizations that modernized their computer systems to facilitate patient record access. 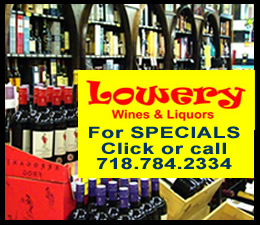 See February 12, 2012 story by our sister web magazine about Doctors in Queens. Joel Cantor of Rutgers said that there are about 80 different programs built into the Affordable Care Act. They are designed to improve follow up patient care and facilitate transitioning patients from one healthcare provider to another. He reiterated that fees paid to hospitals decline for re-admissions within 30 days. The navigators of the Affordable Care Act in New York State and other states are assigned with helping people 'navigate' the new healthcare system until they are comfortable enough to navigate it on their own. 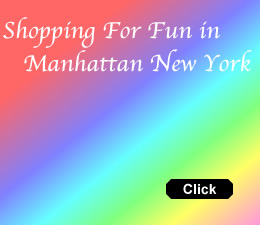 Click here to view a list of healthcare navigators for Queens NY which we posted early in 2014. Byron Hurt, the documentary filmmaker of Soul Food Junkies, told us about losing his father to pancreatic cancer. Pancreatic cancer is one of the most terminal cancers in the world because its frequently diagnosed long after it has taken root and there still aren't any cures. Even billionaire technologist Steven Jobs died of this cancer. Byron did a film about his father's struggle with the insurance companies, the healthcare system and his personal struggle with eating nutritional food versus the food he liked and that was a part of his life. He noted that part of what motivated him to create the documentary was that Latinos and African Americans have the highest incidence of diabetes, cancer and heart disease. Byron said that many folks don't have access to healthy food. And that they're so busy struggling with their own personal lives that they are challenged to make the necessary lifestyle changes. My interpretation of what he was saying was that the relative health of various ethnicities is due more to culture and economics than genetics. He went on to say that the Affordable Care Act provides people / patients with access to the experts and information they need. Brian Lehrer then cut to the audience for commentary and Q & A. Brian Lehrer is shown standing at right. 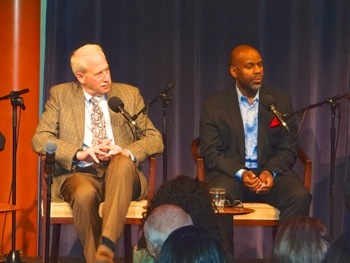 Brian moderated the WNYC NPR forum about the Affordable Care Act at the New Jersey Performing Arts Center in Newark. One woman said that she was disappointed in the Affordable Care Act enrollment process. She said that the state and local elected officials didn't do enough to help people enroll. She said that the only reason New Jersey attained such a good enrollment is because the religious and social organizations chipped in to help folks enroll. Another woman said that many folks don't know any more about the Affordable Care Act than a year ago. Someone said that hospitals are economically reliant / hooked on the Emergency Room 'charity work' they do, for which the government pays. They cited the closure of Martin Luther King Hospital in East LA, which in 2007 handled 45,000 emergency room patients according to the LA Weekly. And that University Hospital in Newark had issues over the past decade too. If I'm not mistaken, University Hospital in Newark is now a part of Rutgers University. Medicaid Discrimination Or A Healthcare System Transitioning To The Management Of Larger Numbers Of Patients? Someone said that they felt that medical professionals discriminated against Medicaid patients. They said they were treated like a second-class citizen by some physicians in the area. Sandra Scott, Emergency Room Director of University Hospital said that some medical institutions are stressed by the significant increase in patient demand, without having an attendant increase in resources. Over time the number of physicians is expected to increase because incentives to increase the number of medical students / graduates was built into the Affordable Care Act. Dr. Joel Cantor of Rutgers opined that expanding Affordable Care Act enrollment going forward is expected to be more challenging. He surmised that the majority of those who are computer literate and who could navigate the complexities of the new healthcare program likely did so in 2014. And, he said, resources for educating the public and signing them up are being reduced in year two of the implementation. Larry Altman of Horizon Blue Cross / Blue Shield of New Jersey said that the Affordable Care Act is about 2,000 pages long and that it includes thousands of regulations / regulatory guidelines. He noted that Medicaid Part D which covered Medicaid prescription drugs - was implemented by the Bush Administration in 2005 / 2006. In the beginning patients, providers and insurers had difficulty navigating their way through the new regulations, but today it's no big deal. He opined that as the nation moves along the learning curve and outstanding issues are ironed out, that the same would be true for the Affordable Care Act. 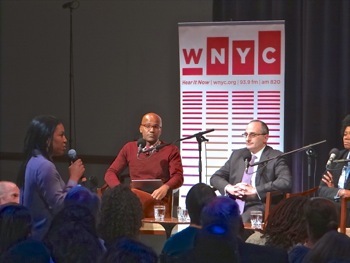 Kai Wright, WNYC reporter, said that the Affordable Care Act was complicated by the politics surrounding it. Starting with the Supreme Court Ruling that states weren't obligated to participate [currently 26 of the 50 states have implemented the Affordable Care Act]. See previously shown chart to your right. Then there was the issue of states running their own exchanges [like New York has a Democratic Governor] and states letting the federal government implement the system [New Jersey has a Republican Governor]. And last, but not least, he said, was the opening snafu of the federal exchange computer system in the fall of 2013. He told us that the cost of enrollments by the federal government was about $2 per enrollee, while the cost of state enrollees was nearly $14. And there was a time element too, as the federal enrollees took about 45 minutes to enroll, while the state exchanges took about two hours. Larry Altman of Horizon Blue Cross / Blue Shield of New Jersey responded to a question about the program complexity. He noted that the insurance programs listed on the Affordable Care Act exchanges offer different levels of care. Some have co-pays, some not, some mixed. There was something about co-insurance. 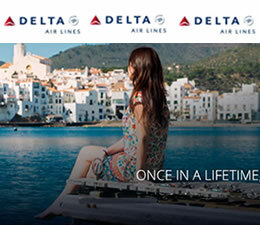 And of course different prices mean you get a different set of insurance benefits. 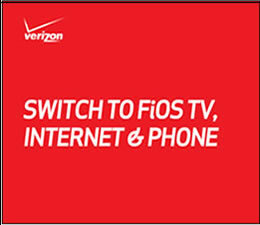 He said most folks opted for the lowest price plans. And that some didn't know what they were buying and didn't get what they wanted. He said that over time people will become better educated healthcare consumers by going to programs like this, talking to the navigators and healthcare providers and insurance companies and reading stories like the one you're reading now [thanks]. He believed that more of the cost of healthcare insurance would be passed onto the consumer because: 1) it lowers the premiums and 2) consumers will become more engaged in their healthcare costs. Right now folks pay a $5 - $10 co-pay for prescription drugs when on average they cost $50 - $100. He also thought that insurance companies would change the co-pays from flat dollar amounts to percentages for the same reason. He went on to outline additional complexities of the American healthcare system and Affordable Care Act program. There are in-network provisions [meaning you're covered] and out-of-network provisions [meaning you're on your own]. There was also the issue of in-state coverage versus out-of-state coverage, which varies by plan. Lastly, but not least, there was the question of which physicians are participating in the plan and what services they provide within the plan. Larry outlined what he thought were some of the trends we'd be seeing in addition to what he outlined above. 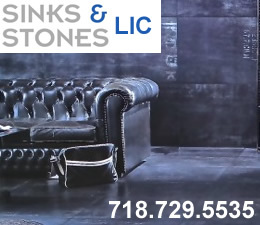 You will see more out-of-pocket costs and you will see a more narrow list of providers. The net effect is that barriers may arise with respect to certain specialty doctors. The chart above shows the long term trend of employee paid costs of health insurance. 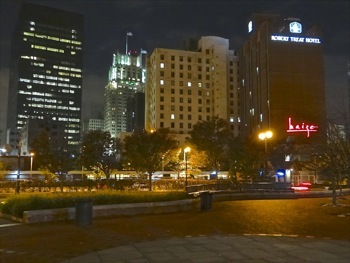 Newark NJ - Medicaid Doctor Shortage? Someone said that Newark has one of the most significant shortages of Medicaid doctors. Someone said there are laws governing doctor patient interactions - The Patient Protection Act. They noted that there may be applicable state laws too. Someone said the minimum wage doesn't provide humans with a living wage. At the end a woman got up and told us about her personal struggle the past ten years with a sick daughter and she'd recently become sick herself. She was once a journalist for the Wall Street Journal and has lost her job and is in danger of losing her home. She said she was thankful for 'Obamacare' but that the program is very complex. I'm not sure if it was the woman mentioned above, or someone else, but single payer system entered the conversation and was rapidly picked up and echoed throughout the chamber. 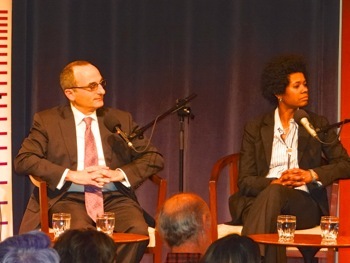 The time for this forum had run over and it was at this point that Brian Lehrer wrapped it up. As I exited I conversed with several people who'd attended the forum. I met a doctor, an insurance representative and several other folks in healthcare related fields. The doctor said that she took Medicaid patients, but that Medicaid didn't pay well. She went on to say she still had her own rent to pay, along with hundreds of thousands in school loans. I have heard this sentiment [low pay] expressed by many healthcare professionals who accept Medicaid patients. The insurance representative said that some folks don't like Obamacare because their insurance rates are going up because of it. I spent some time researching this sentiment on the web and couldn't find any non-political sources that addressed whether there was any economic causality between the implementation of the Affordable Care Act and private insurance. The Republicans state that insurance premiums have risen because of Obamacare although there's been little change in the moving average growth rates. The Obama Administration had stated that a few years of slowing insurance rate increases were a result of the Affordable Care Act, but again no causality was proven. So we went to the independent non-profit Kaiser Family Foundation for guidance. They provided information which shows that insurance rates continue to rise as they have been doing for decades, and that there's a second long term trend which is that the portion of health insurance paid by employees has continued to rise too. This second trend, increasing consumer healthcare costs, harks back to statements made by the Blue Cross Blue Shield representative who forecast that co-pays and other cost incentives would be used to motivate the consumer to become more engaged in managing healthcare costs. 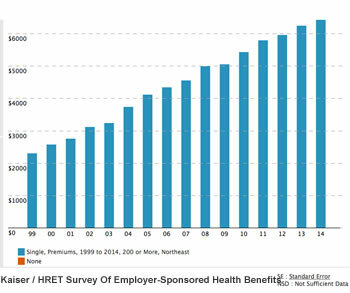 The chart above shows the long term trend of employee paid costs of health insurance. I had shown this chart above too. One person remarked that the Affordable Care Act would increase the U.S. public deficit. I went online started tracking this line of questioning down. The Congressional Budget Office a few years ago predicted that the Affordable Care Act would reduce the budget deficit. Earlier this year the CBO retreated from that position stating that there were too many at risk variables for them to accurately predict the impact of the Affordable Care Act. The Congressional Budget Office [CBO] is generally regarded as one of the most reliable sources for predicting the financial and budgetary impact of federal government legislated programs. Given the experts in the CBO aren't comfortable providing any budgetary guidance, we opted not to reprint the remarks of either party's amateurs. 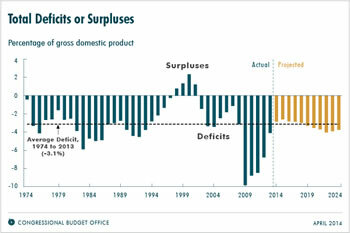 I looked up the U.S. government deficit and was surprised that the U.S. federal deficit has been declining. The first Obama Administration budget in 2010 included a deficit of $1.3 trillion. The 2014 the budget deficit is expected to be $483 billion. An improvement to be sure, but we're still operating beyond our means. The Affordable Care Act exchanges opened on October 1st and enrollment for 2015 begins on November 15th. Thanks for reading. 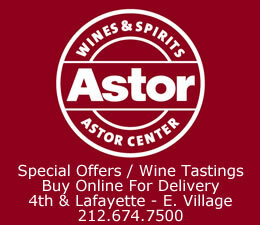 Special thanks goes to the NPR radio station WNYC and specifically the Brian Lehrer Show for organizing the event. And also to the New Jersey Performing Arts Center for hosting it.